Glossy Clear Slotted Luggage Card Size Laminating Pouch 65mm x 108mm – (Box 100) 150 Micron thickness(With Pre Punched Slot).Laminates Luggage & ID Cards. Give your Luggage Cards/Tags, Identification Cards, Pictures & Membership Cards a protective finish. 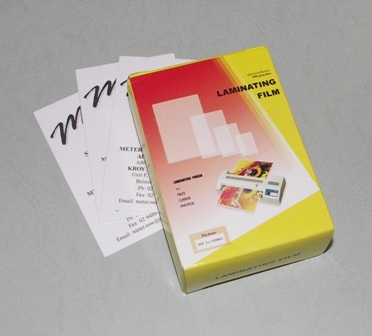 Meter Card & ID Laminating Pouches extend the life of your card and make it tamperproof. Check your card size before ordering and ensure your Meter ID Laminating Pouches are slightly oversized to laminate and seal.